Security is one of the most concerns when it comes to protecting property in home, office, garage etc., Traditional keys have provided a good security level in the past, but now getting weaker and weaker, as the bypass technologies improve. Smart locks are now playing an important role in protecting home and office security. They are not only bringing in security but also convenience. We have reviewed many smart locks in the market, and we have to say, after head-to-head comparison. PIN Genie smart lock beats all and we ranked as the best smart lock by its unique features in making home owners and Airbnb hosts’ life safer and better. Trendy heavy and robust locks now have been replaced by the Smart deadbolts to some extent. PIN Genie Smart Locks has very well established name in the field of smart locks. It took more than two years of development and various ongoing tests and optimizations process to enhance the features of this beautiful-looking highly secured lock. PIN Genie Smart Lock includes very high-security solutions. The company has launched two types of smart locks at the retail price of $199 for PIN Genie Smart Lock Essential and $259 for PIN Genie Smart Lock Pro which you can quickly get at online stores of the company. Peep-Proof & Hidden Camera Proof PIN Pad: – It is one of the most amazing features which makes it stand out from the crowd of smart locks. The numbers 0-9 are given on the PIN pad which reshuffles after every use which makes it peep proof because even if someone peeped in while you were entering the code, he might not know it actually because of the automatic reshuffling the numbers. I found this feature amazing. Limited Wrong PIN Entry: – If someone wants to break your security code and tries to unlock your password for this smart lock, this fantastic gadget automatically tightens ups the security of the bolt and asks for the password verification after the input of three-time wrong passwords. That is an added security layer which makes sure that someone else cannot get in. Now, you do not have to worry about the breakdown of your lock in case if you have left your home alone. Safe Home Mode: – Privacy and security are the things that everyone needs to have for their home so that they and their children can feel safe at home. PIN Genie Smart Lock provides you the excellent option of Safe Home Mode and disables the touchscreen when you are at home. It can be activated just by pressing the button on the back of Lock. Now, no one can activate the lock from outside. Alarm mode: – Another best feature of this beautiful-looking smart lock is the alarm system it includes. You to get you alert with the help of inbuilt alarm system if someone wants to enter your home without your permission. Hence, you can stay relaxed and safe, even if you are staying home alone or have gone out for walking or somewhere else near to home. 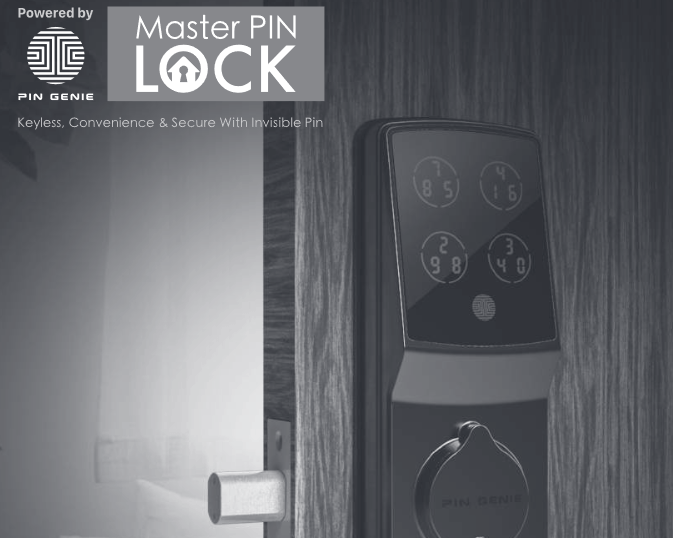 Bluetooth Connectivity: PIN Genie offers an app for its smart lock as well which helps you connect your smartphone to your Smart lock using the Bluetooth facility, and you can activate the door using it. It ensures the best security for your home or office. All you can see is, PIN Genie beats the competition and offers the best security for home and offices. 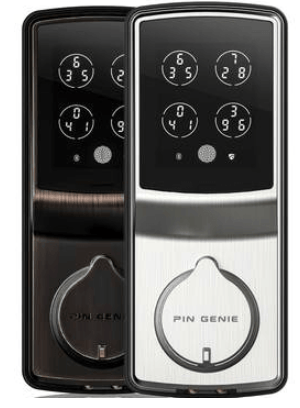 PIN Genie Smart Lock is one of the best electronic door locks in the market currently which you can buy from Amazon as well.